If you have lost connection with your battery or had to replace your radio in the your Renault you will need to input the code. But firstly you will have to remove your radio, get the serial number and generate the security code. These are inserted either side of the radio in the 4 corresponding holes. 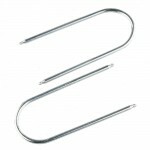 This releases the latch and lets you pull the radio out. Find the serial number sticker, usually on the right hand side of the radio. You are looking for the last 4 digits of the serial number. The number needed must be in the format A123 (Letter Number Number Number). 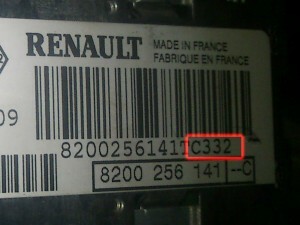 For example C332 is the security number in the image of the radio below. To generate your unlock code from these 4 digits you will need to a use a service such as This One. Check out this video to see how to remove the radio and input code. To get your security code from your serial number check out the following post.